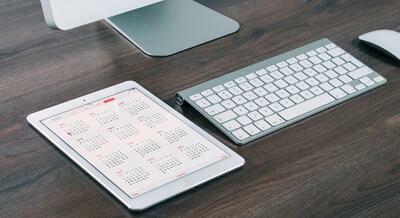 So, you want to maximize your presence on YouTube, but you’re short on time and resources? Thankfully, there is an easy solution: YouTube playlists. Consider this article your complete guide on everything and anything you need to create YouTube playlists your viewers will love. You'll find detailed instructions on not just creating a YouTube playlist, but also editing them, the benefits of playlists for YouTube viewers and creators, and expert YouTuber advice on how to use playlists when you're short on video content. If you’re looking for easy instructions on how to make a YouTube playlist, you’ve come to the right place! Playlists are an easy step when you are learning how to make a YouTube channel. Here are some basic instructions to create a YouTube playlist. Find the video you want in your playlist. Choose the channel privacy settings: public, unlisted, or private. The whole process can be done in just one minute. (Or less!). Later, I’ll go through those instructions in more detail, with images to walk you through the process. Before we get too deep into playlist instructions, you need to understand what a playlist is, the benefits of a playlist, and how you will use YouTube playlists to further your goals. If you’re ready to jump ahead, simply click on any of the bullet points listed above. Otherwise, we’ll start at the beginning: What is a YouTube playlist? A playlist is a group of videos created by you or someone else on YouTube. Whether you are a YouTube viewer or creator, it’s a way to organize videos with similar characteristics. If you’ve created any music playlists in the past, it’s a concept you’ll be familiar with. For example, as an actor, I have a playlist of pump-up songs I love to listen to when I need high energy before a performance. In the same way, I could create a playlist of YouTube videos. 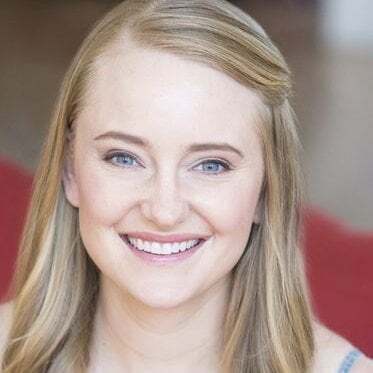 When I want to use YouTube for research and inspiration, I could create a playlist of actor interviews or auditions. 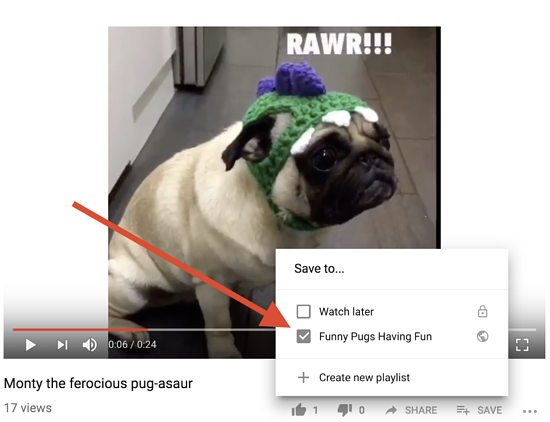 In a nutshell, playlists make it easy for viewers to find the videos they want to watch – with a few simple clicks, videos are saved and sorted. When you are building your YouTube strategy and exploring the channel you’ll see that playlists don’t just apply to viewers; they’re essential for YouTube creators too. Without playlists, your channel looks blank, and you aren’t giving your uploaded YouTube videos the maximum potential exposure. Let’s take a deeper dive into exactly why playlists are so beneficial, including expert advice you don’t want to miss from video and YouTube expert Mykim Dang. As of October 2016, YouTube had more than 1 billion active users on the social media platform every month. Going back even further to October 2015, YouTube proved itself to be the go-to social media source for video. Every single day, Americans spent an aggregate of 8,061 years watching YouTube. Yes, you read that correctly: 8,061 years. Every. Single. Day. And that’s just in the United States! With that much content consumption, it makes sense that YouTube users have plenty of videos to choose from. 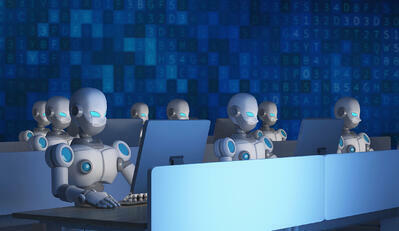 In fact, there are over 400 hours of video uploaded to YouTube every minute. Additionally, playlists are helpful for those using YouTube to conduct research (see: How to Cite a Video on YouTube). We’ve established there are a whole lot of videos on YouTube. So, what do you do when you stumble upon a video you really want to watch, but it runs for 20 minutes, and you only have two minutes? What are the chances you’ll find it again? You better hope you remember the search terms you used! Saving videos to playlists ensures you can find them again. In addition, you can organize those videos the same way YouTube creators do. Many YouTube viewers create music playlists. It provides the same advantage of music playlists made up of mp3s – you can listen to the playlist on a loop while working or studying. This is just one way YouTube playlists can be used to provide viewer benefits. If you’re a YouTube creator, having a channel without playlists is like running a candy store that doesn’t have any shelves, boxes, or containers. The candy is all there, and, sure, it’s delicious, but it’s impossible for customers to find that sweet treat they’re craving. If you have a YouTube channel, there are four benefits to consider, especially if YouTube is part of your social media marketing strategy. Throughout these benefits, I’ll show you some examples based on the YouTube channel for America’s Test Kitchen. Let’s start with the first benefit – getting your videos more views! It’s not just videos that come up in YouTube search results, it’s playlists too! When I type, “kitchen equipment reviews,” into the YouTube search bar, the very first thing that comes up is an “Equipment Reviews” playlist on the America’s Test Kitchen YouTube channel. Without having a playlist, the company would lose that top spot in search results. Sure, one of its videos comes up third, showing a review for storage containers, but what if that’s not the product I’m looking for? Not only does the YouTube playlist give America’s Test Kitchen the top spot, but I can also see it has 52 videos in the playlist. This encourages me to click and see if it has the review I want, as well as other kitchen reviews I might be interested in. Creating playlists with a strong focus on keywords gives your channel (and your videos!) more opportunities for exposure to YouTube users. If no one can find your video, it doesn’t matter how fabulous your content is – you’ll still be missing out on the opportunities a YouTube channel provides. If you don’t add playlists to your YouTube channel, it will look pretty blank. Not only will your channel appear unprofessional, but it will look like you’re lacking in content. And, if that’s the case, what reason does anyone have to subscribe to your channel? 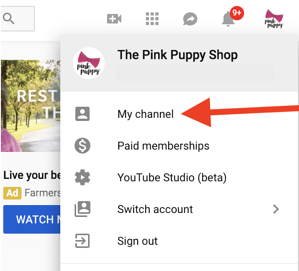 When you start creating your YouTube channel, one playlist will automatically be added to your profile page. This is the, “Uploads,” playlist, which shows just five videos you have added to your channel. The three playlists you see in that image are just the beginning! 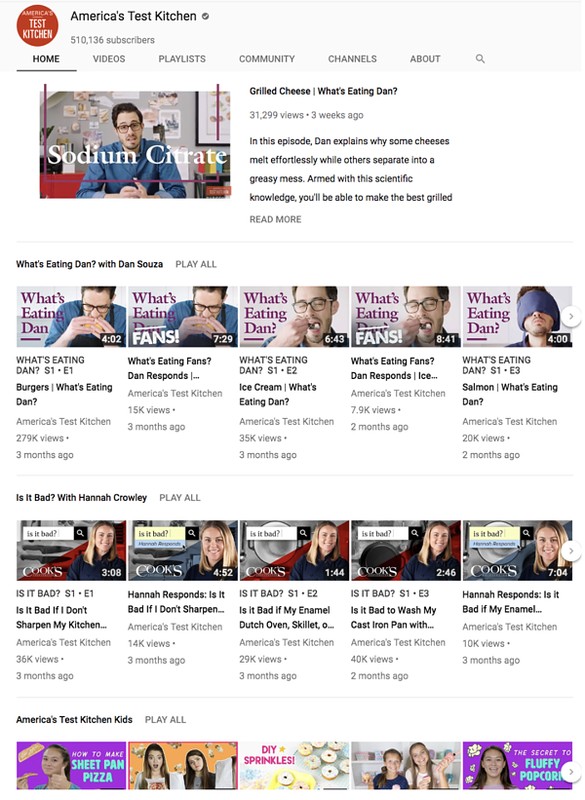 Having all of these playlists gives YouTube viewers an understanding of the value and type of content America’s Test Kitchen provides. For example, a Mom with kids who enjoy cooking might see, “America’s Test Kitchen Kids,” and subscribe to share the videos with her family. In the second benefit of YouTube playlists, I mentioned they help channel visitors see the range of content you have. This is especially beneficial for the awareness stage, when people are discovering your brand in search results. Imagine that I’m already familiar with America’s Test Kitchen, and I want to find a video on its channel. With 10 playlists, and over 50 videos on just one of those playlists, it’s easy for content to get lost. As displayed in this screenshot, there were 12 new videos added to the channel in the past three weeks alone! 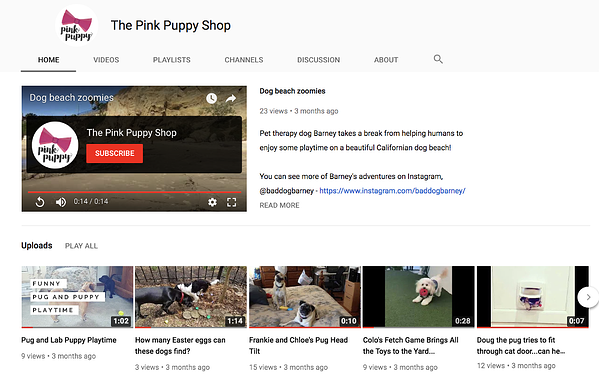 By organizing your content into playlists, YouTube users can find the content they need with minimum scrolling. Think of Youtube playlists as a form of navigation for your channel. If people can’t find what they want quickly, it’s a safe bet they’ll leave your channel and look somewhere else! Wondering why I’ve had such a focus on America’s Test Kitchen? Well, I promised you expert advice for your YouTube channel. So, here it is from Mykim Dang, former Director of Video for America’s Test Kitchen and Executive Producer of her own production company. Not only that, but Mykim is also the Senior Director of Brand, Strategy and Innovation at Comes & Zeyben Marketing Consulting. 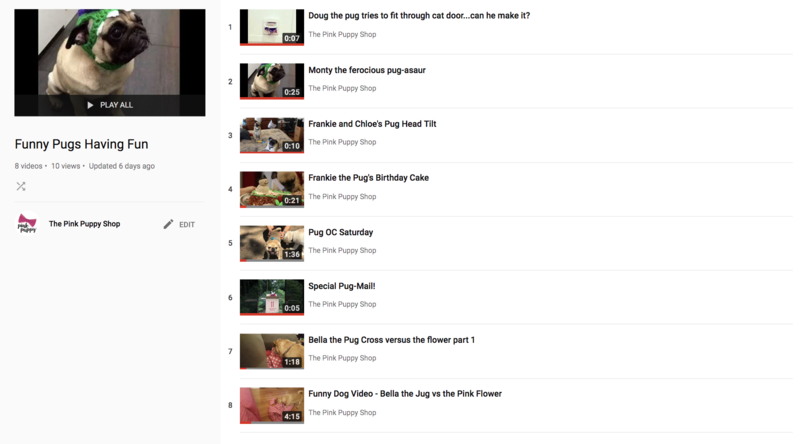 Here, Mykim Dang shares the best advantage of YouTube playlists: content curation. “Playlists are straight from YouTube certification school, and they are something anyone can do. Youtube playlists give an especially helpful solution when people are starting out and resources are strained. What is that solution? Curated playlists. Curating playlists serves your potential audience and their interests. Plus, it grows your potential to work with collaborators of content and creators you’d like to align with. Creating and curating playlists based on interest or category can be extremely beneficial, from both a value-add and a search perspective. Playlists can serve internal business purposes too. A more creative example consists of curating a playlist of music videos that your brand is inspired by – imagine a playlist for the sales team that gets them pumped to close deals. Curated playlists are made using videos created by other YouTubers. When I search YouTube for, “sales videos,” one of the results is this playlist for, “Inside Sales Training Videos,” by Kyle Beaty. 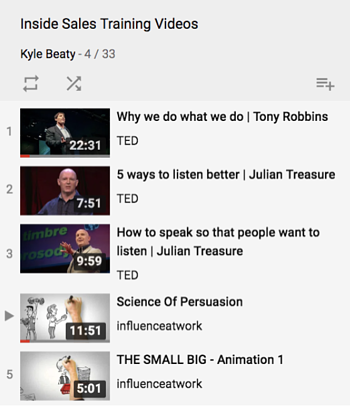 When I Click on the playlist, the first five videos that come up are not from Kyle, but from the TED and Influence at Work channels. Even though Kyle didn’t create the content in the playlists, he is still able to display them on his YouTube channel. This enables him to maximize on all of the previously mentioned playlist benefits. We’re about to walk through the steps of creating a YouTube playlist. As you look at the steps, keep in mind that you can follow the same instructions with videos created by other YouTubers. As mentioned by Mykim, in addition to giving your channel more content, YouTube playlists are a great way to build relationships, as you share and promote content created by other YouTubers you admire. There are several ways you can create a YouTube playlist. Here, we’ll walk through the steps mentioned at the beginning of this article. The images below demonstrate the process on a desktop. You can use the same steps to make a playlist using the YouTube app on your phone or tablet. The first step starts with just one video. Begin by finding a YouTube video you’d like to include in your playlist. You will now be able to see all the videos you have uploaded to your YouTube channel. Click on your chosen video, and it will open on your screen. Once you have your selected video ready, click on the, “Add to,” button. It is three horizontal lines with a plus sign. Now, it’s time to enter the name of your playlist. As you’ll notice in the picture, you have a maximum of 150 characters. Grab viewers’ attention: Why should they click on your playlist versus someone else’s? Include keywords – the words people are most likely to search for. Enter the title where instructed to do so. After you have named your playlist, it’s time to choose your privacy settings. This setting appears at the same time you name your playlist and will determine who on YouTube can see your video. To bring up the privacy settings, click on the drop-down arrow. Once you do, three privacy options will appear. 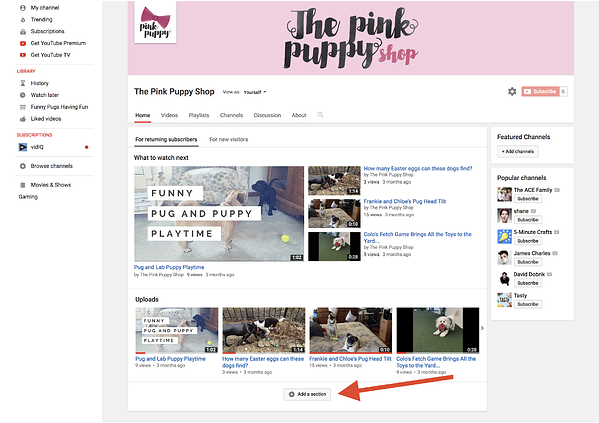 Public: If you want your videos to come up in search results, this is the setting for you! This is the setting to use in a YouTube marketing strategy. Use the public setting for maximum exposure for your videos and YouTube channel. Unlisted: Unlisted means your YouTube channel will not come up in search results, but you can share it with friends, family, co-workers, and customers. For example, if you have a channel with webinars you want to share with your prospects, but you don’t want it made public for competitors to see, you could send prospects an unlisted link. Private: Use private for those channels you’re creating for personal use. These are the channels you don’t intend on sharing with anyone. 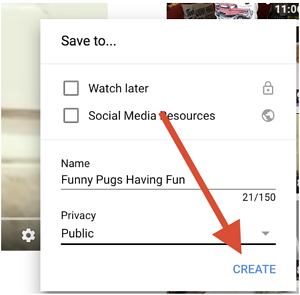 Once you have added your title and chosen YouTube privacy settings, click on the, “Create,” button. You have now created your playlist! To view it, go back to your YouTube channel homepage, and click on the, “Playlists,” tab. From here, you’ll be able to see every playlist you’ve created. Notice that YouTube automatically creates a list of videos you’ve liked. The list is private (whew! ), but it’s good to know anytime you like a video, you’ll be able to find it again. Now that you’ve created your playlist, it’s time to add videos. Do this by following the same process outlined in step two. This time, when you click the YouTube, “Save to,” button, the playlist you just created will appear. Simply tick the box, and the video will be added to your playlist. If you don't want to add videos one at a time, there is another option. Instead of going to each playlist video, now we'll add videos directly from your YouTube playlist. When you're logged in to your YouTube channel, you'll see all of your videos listed under "library" on the left side of the page. Click on the playlist you would like to add videos to and edit. The playlist will appear on the next screen. Click on the "edit" button, found to the right of your channel icon. On the next screen that appears, you'll notice a button to "Add videos." Now you can add videos to your playlist. Simply enter your keyword, select the videos you would like to use, then click the "add videos" button. You can also add videos by entering the url for another YouTube video. Or, choose "Your YouTube videos." 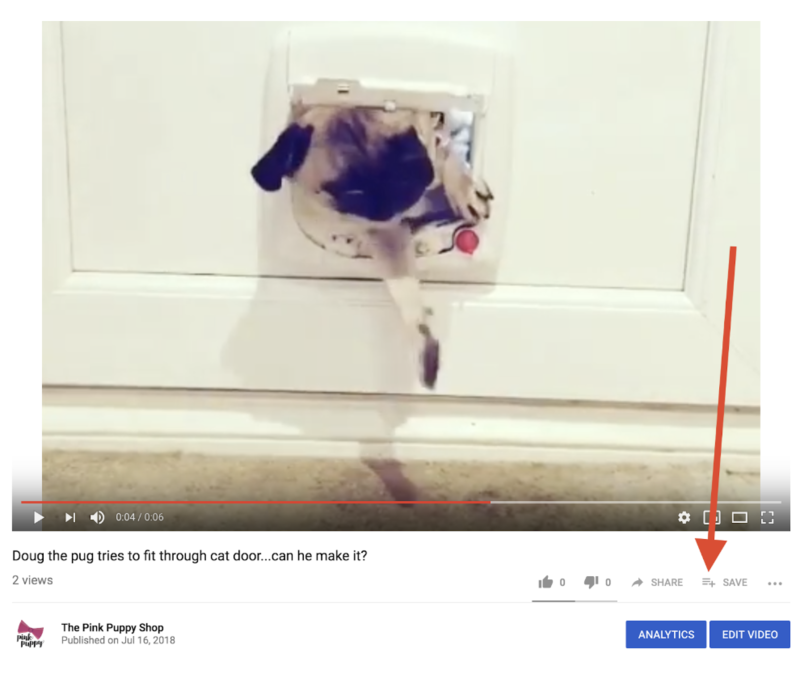 All videos you have uploaded to your YouTube channel will appear, simply click on each video you'd like to add, and once again click the "Add videos" button. Once you have clicked the "Add video" button, you will be taken back to a list displaying all videos on your playlist – including the newest additions! Can I add the same YouTube video to multiple playlists? 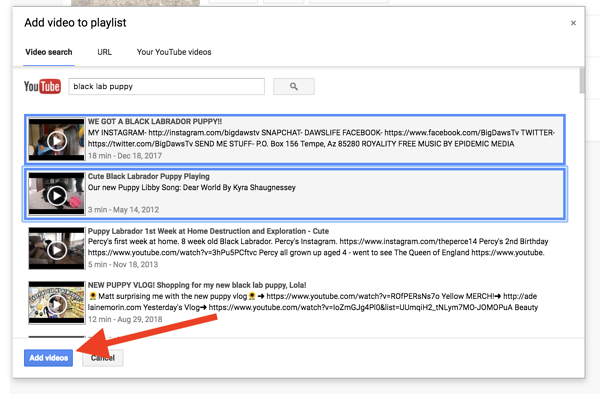 Once you start creating YouTube playlists, you’ll realize the endless ways you can organize your content. Sometimes, a video will be relevant for multiple playlists. 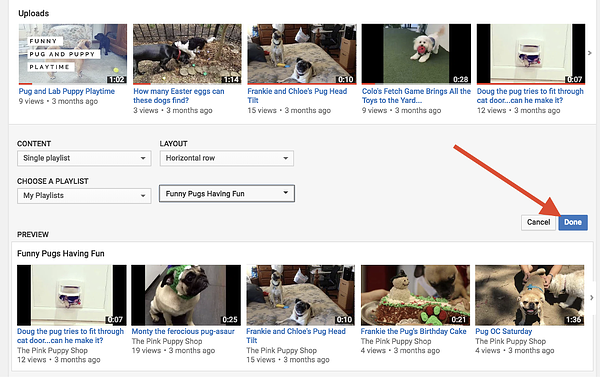 For example, the playlists I’m creating for this tutorial are all made using dog videos. I have one playlist with pug videos and another featuring certified pet therapy dogs. 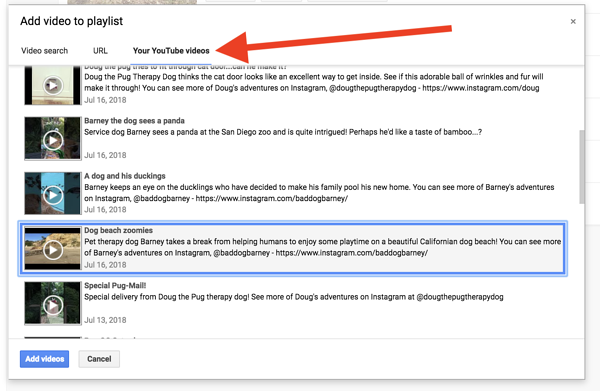 The, “Special Pug-Mail,” video shows Doug, a therapy pug, so I want to add him to both playlists. Because I had already created the playlists, all I need to do is tick the box next to both playlists. 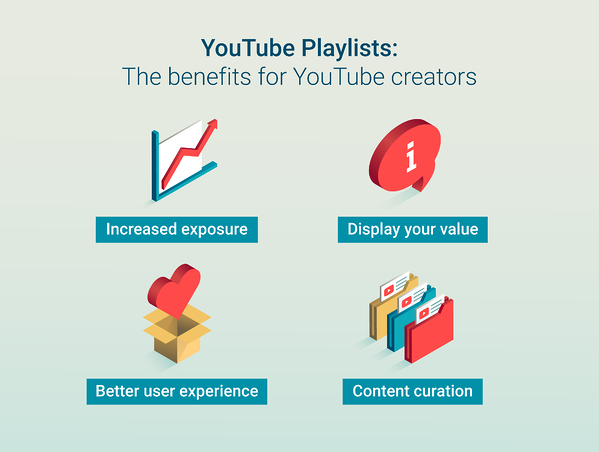 In the benefits listed above, I shared how having YouTube playlists displayed on your channel gives users a better understanding of your content, increases engagement, and helps viewers find your videos. However, once you create your playlist, it will not automatically be added to your YouTube page. Here are your instructions to make any and all desired playlists appear on your YouTube channel. 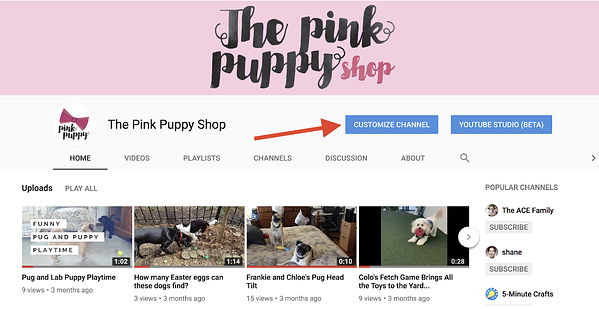 Navigate to your channel and choose the, “Customize channel,” button. At the bottom of your page, you’ll notice a button to, “Add a section,” with a plus sign. Click this button. Click on the, “Select content,” drop-down menu that appears. In that drop-down menu, choose the button that says, “Single playlist." You’ll then see another row appear with two more drop-down menus. Click the box on the right that says, “Find playlist.” Click the drop-down menu and give the page a moment to load. Then, all of the playlists you have created will appear. Choose the playlist you’d like to add, and a preview will appear, showing how the playlist will look on your YouTube channel page. If you’re happy with the preview, click the, “Done” button, and the playlist will appear to all of your YouTube channel visitors. 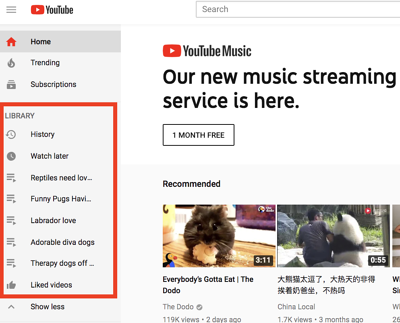 Continue this process, beginning with the, “Add a section” button, until you’ve added all the playlists you want to your YouTube channel. Now your videos have maximum exposure to anyone who visits your page! Once you have created your YouTube playlist, you may want to make some adjustments. For example, you may want to change the order of the videos within the playlist or delete a video. To edit your playlist, begin by navigating to your channel. Then, choose the, “Playlists,” button at the top of the page. Once you do so, all of the playlists you have created will appear. You’ll see a vertical list displaying all videos from your YouTube playlist. To rearrange the order of your videos, simply click and drag them. 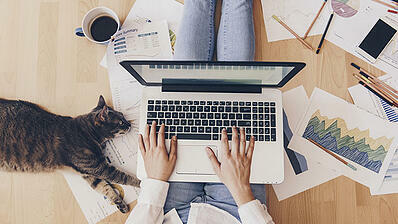 For more editing options, hold your mouse and hover over a playlist video. Three dots will appear on the right side when you do this. Choose a video for your playlist thumbnail that has an extra dose of intrigue and curiosity. This is how you’ll help viewers choose your playlist when it appears in search results. If, rather than editing a playlist, you would like to delete it entirely, I've got you covered: Read how to delete playlists on YouTube. 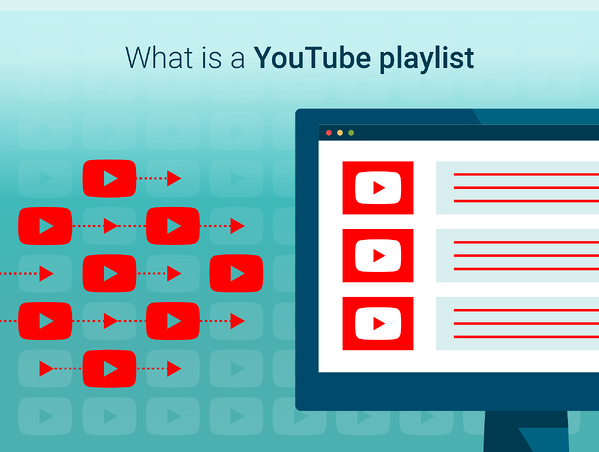 Now that you know how to make a playlist on YouTube and the many benefits they provide, it’s time to start strategizing. Do you want to use your own YouTube channel videos or curate content from others? Go ahead and do both! Don’t forget about the other elements required for a successful YouTube channel. To increase subscribers and ensure your page looks professional, download the YouTube banner template, YouTube thumbnail template, and YouTube profile picture template. Or, learn how to delete a YouTube account or enable YouTube dark mode. No matter what you’re looking to do on the platform, your YouTube possibilities really are endless, and now you have all the tools to utilize them!